Development of new subdivision techniques based on the Euler-Lagrange differential equations for splines in quaternion space. An intuitive and simple set of coefficients to optimize over which is different from the conventional B-spline coefficients. Widespread use of unconstrained minimization as opposed to constrained optimization needed by many previous methods. This speeds up the algorithm significantly, while still maintaining keyframe constraints accurately. Animators often desire to specify their animations by a sequence of fairly widely spaced keyframes that capture the essence of the motion. Without adequate tools to fill in the intermediate frames in order to produce smooth animation, each intermediate frame must be manually created, a laborious process. We seek to design methods that can rapidly interpolate keyframes to create animations, thus allowing the animator to concentrate on design rather than the fine details. The method first places a spline path through the user-defined keyframes, and measures the degree of constraint satisfaction within the spline segments. Unsatisfactory segments are automatically subdivided; ``variable'' frames are inserted. An optimizer then improves the degree of constraint-satisfaction by moving the variable frames to better positions. The technique is similar to the spacetime constraints paradigm but we apply our method to interpolation of keyframes rather than to novel methods of creating animation. Thus, our technique is closer to conventional animation techniques, and can be used easily in conjunction with them for fast improvements of ``rough'' animations or for interpolation to allow sparser keyframing. Covariant Interpolation of Quaternions We have speeded up the construction of covariant acceleration-minimizing quaternion curves by a factor of 100. We have also introduced new techniques for adaptive refinement based on the Euler-Lagrange error functional. Foot placement for a Running Articulated System We apply our method to making simple improvements in the motion of a person-like figure. For this fairly complex system, we are rapidly able to prevent feet penetrating the floor as sometimes happens in the splined motion. Research page for related paper on fast construction of accurate quaternion splines. 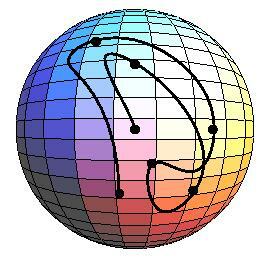 Covariant interpolation of quaternions with this method is approximately 100 times faster than previous methods. We show keyframes and a sample frame from a human figure running and jumping onto a step. 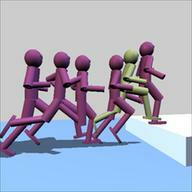 Top: In the unoptimized splined animation, the runner's foot passes through the step. Bottom: Optimizing the animation from the same keyframes. The foot does not pass through the step. The soft constraints have lifted the foot out of the way.